Good day to you all, gamebook lovers! 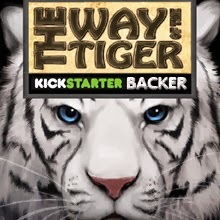 Today, we have another great guest post from the fantastic David Walters who is writing the prequel book to the Way of the Tiger series, Ninja! In case you don't know, David, Mark Smith, Jamie Thomson and the guys from Megara have all teamed up to recreate the popular 80s gamebook series, Way of the Tiger with the prequel and also book 7, Redeemer!, which means that our hero can finally get out of that blasted spider's web from book 6. Only 5 days in, the kickstarter has managed to raise a fantastic $15070, which puts it on its first stretch goal. There are stretch goals that go all the way up to $100000, so your money is still needed and who can say no to a superb gamebook series crossed with beauty that graces all of Megara's works? In case you don't know just how fantastic they are, take a look at my reviews for book 1 and book 2 on my other blog. I'm hosting part 2 of David's series on his experience writing the prequel to an already established gamebook series. Part 1 can be found on the blog of Brewin' and part 3 will is on Scott' Malthouse's Trollish Delver blog. Enjoy! I’m David Walters, and I was tasked with writing the prequel story to the Way of the Tiger books, a series of six ninja gamebooks set on the world of Orb. I found there were a few advantages to writing a prequel as I undertook the task, which I’ve mentioned below. By writing for an already established series I found that I already had a wealth of places, characters and cultural references (including the gods of Orb) to draw on. This allowed me to concentrate my efforts more on story and character, as the setting of Orb was already richly detailed. The ninja skills and background of the main character was already detailed as well, which made it clear what kind of choices Avenger might have to available during encounters. In many ways I could use the detailed background to inspire interesting scenes. The readers may already know what Avenger does in other books, but a prequel gave me the chance to explore the backstory. This lets the reader choose what kind of events shaped Avenger into the character that they have come to know and love. I was also able to deepen some of the other characters a little: after reading the prequel the reader will hopefully better understand why in book 1 the Grandmaster of the Dawn was so willing to send Avenger out alone on such an important quest. Other characters could also be explored by having choices in dialogue that led to different information, showing more character background. I did not need to spend any time creating rules for this gamebook as they already existed and had been extensively ‘road tested’ in the main series. This meant that I could focus more on crafting the story and its interesting choices without worrying as much on what rules to use. The rules (such as the ninja special skills) also gave a clear direction as to how to set up some of the scenes of the prequel which were to then use those skills. I did not need to worry about which direction to take Avenger as it was already set out in later books. This meant that I could spend my time ensuring a good fit with the rest of the series through references to characters and situations already familiar to fans. I also had the benefit of an established backstory of Avenger’s childhood and training which meant I did not have to establish one especially for the prequel. Thanks again for posting about us. It's fascinating to read up on the challenges in this writing. Myself, as the editor, I also must think about these issues, but often it's in the opposite direction: was a game rule violated? Did any dialogue fall in the wrong conversation chain? Did a line or word appear that contradicted a later book? Because it's a team effort, any really weird issues lead to long and interesting conversations about what "should" happen. Those are particularly fun to have, especially when the even-more-established authors (Mark and Jamie) are in the e-mail chain. Pretty interesting blog, I liked it. It seems an altogether diff realm in writing. Congratulations and best of luck, but the costs of this kickstarter initiative are too high for my small pocket. Thanks Gaurav & Yaztromo - the prequel is $15 for the electronic copy which still contains all the colour artwork - so hopefully that is affordable. The book is 420 paragraphs long, about 70,000 words, and all of it is an epic story playing as a ninja! It has been tremendous fun to write.